This is the homepage of writer Leif Jacobsen! I write fiction for children and young adults. 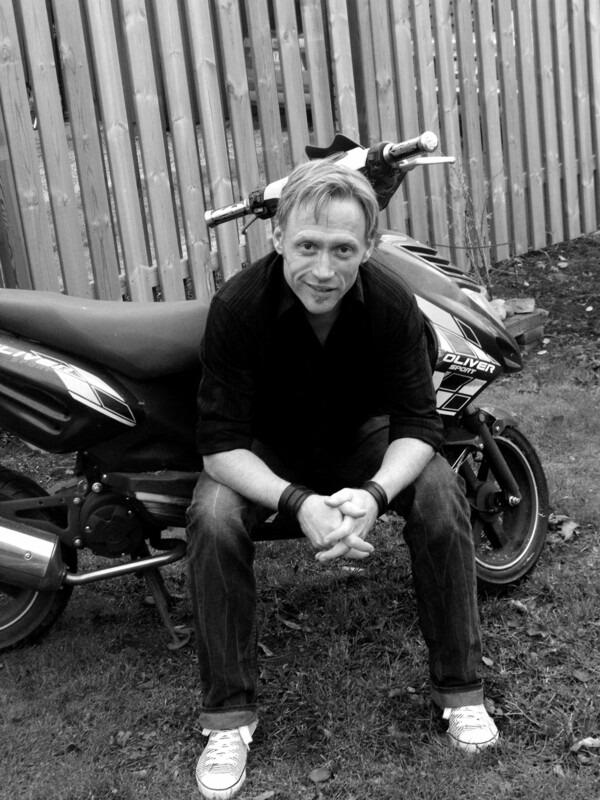 I made my debut in 2009 with the novel Razzia (Raid), the first part in an easy-to-read series of four about three guys who loves everthing about mopeds. The cops has come to the village of Petter, Lukas, and Krille to set up a raid. Enough is enough! The illegal tuning of mopeds has to come to a stop! But the coppers are in for a surprise! The concluding part in the moped series, Allt eller inget (All or Nothing) was published in 2012. Bang and his nemesis, Lund, need to decide who the stolen moped belongs to, and the only way to decide is through a street race, which engages every girl and boy in the two villages. But something devastating happens. Bang is in an accident and is injured. He cannot drive in the race. Someone else has to. But who? The moped books are all published by Bokförlaget Hegas in Sweden. Also published by Hegas in 2012 was the easy-to-read fantasy novel Förrädaren (The Traitor), illustrated by Peter Bergting, Sweden's foremost fantasy illustrator. It is the first part in a series. published. The series will be called BMX Gripen. During 2003–2005, the publishing company Norstedts engaged me as chief reviser for the retranslation of J.R.R. Tolkien’s The Lord of the Rings. Prior to that, I received my Masters degree in English Literature and Language, at Lund University. For questions and more information bout me and my books, please do not hesitate contacting me.